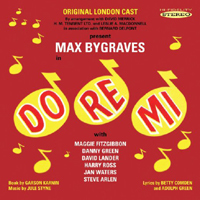 Original London Cast, 1961 (Decca/TER/Sepia) (3 / 5) The middling Styne score doesn’t sound any more impressive as performed on the other side of the Atlantic, but it picks up some arresting oddities in this briskly conducted album. Most jarringly, in a very New York show filled with lyrical references to Far Rockaway, Brooklyn, and Dinty Moore’s, the mostly Brit cast makes no attempt at New York accents. Billed above the title is Max Bygraves, a mugging music-hall comic who manages to be a restrained and affecting Hubie; there’s real wistfulness in his “All of My Life.” The comedienne Maggie Fitzgibbon’s vocal part lies uncomfortably for her, and she makes some very painful noises. Jan Waters, an attractive ingénue, is sturdily partnered by the big-voiced American Steve Arlen in a sweet duet. Some cuts in the overture and a slightly thinned-out orchestra hurt this thin score not a bit. — M.M. Encores! 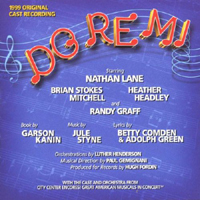 Concert Cast, 1999 (DRG) (3 / 5) City Center’s enterprising musicals-in-staged-concert series had a go at Do Re Mi in 1999, and the cast album of that production improves markedly on the original. For starters, Nathan Lane has more voice than Phil Silvers, and he probably inhabits this type of burlesque-influenced conniver better than anyone alive today. This is also a more complete recording than RCA’s; the lead-in dialogue and extra songs (“He’s a VIP,” “Who Is Mr. Big?”) help us make more sense of the flimsy plot, and the score is followed by a bonus track of a 10-minute interview with the songwriters from the 1960 recording session. Brian Stokes Mitchell’s creamy baritone sells the ballads, and Heather Headley is sweetly understated opposite him. 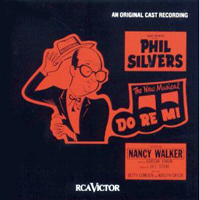 She’s also fine in the send-up of 1950s pop-awfulness “What’s New at the Zoo?” As Kay Cram, Randy Graff works hard, but she’s not the intuitive comedic genius that Nancy Walker was. Paul Gemignani conducts with his customary snap. — M.M.